I love secret gardens, all gardens, parks, wild pockets of nature in the city. These healing spaces make me feel at home. I grew up with my very own garden as a child, my love affair with nature started really young. 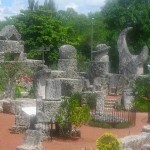 Today, I want to take you on a journey through an enchanting place I fell in love with recently, a magical secret garden: Coral Castle in Miami. What does it take to find home? Everywhere you go, there is possibility and potential for your relationship with home to heal, open, blossom and reveal itself, your colors, your song, your gifts. At home in your own skin, in your own body, in that place that whispers: come out, emerge, shine, play. At home in your heart, in the spaces you inhabit, in the sacred earth, in the world. Unfurling this blood taboo. Menarche, our first blood is an initiation into womanhood, a rite of passage lost to modern culture. I realize that woman’s blood is still taboo: uncomfortable to many, including women.We have disengaged from the beauty of our bodies and the processes that run through us. What was once powerful is now seen as a source of shame. I am delighted that you feel inspired to share this journey with me. It is wintertime and the beginning of 2012, an auspicious time to draw in and nurture our chi, our energy and life force. What are you craving deep in your heart? When I see this pic of Revolution, a multitude of words start to swirl around in my imagination. I feel all these dancing around the word revolution: evolution, revelation, reveling, revolving, love. The Power of Pull by John HagelSome things come into our lives by magic. Such is the magic that drew me to The Power of Pull, an innovative book written or shall we say channeled by my friend and client John Hagel III along with John Seely Brown and Lang Davison. This is not just a book on business, it is a book on living! This revolutionary book is a call for subversive visionaries who are ready to birth a new order, mindset, and paradigm.